When talking to a translator about his or her work, you will sooner or later hear them talk about CAT tools. Computer-Aided Translation Tools are software applications intended to make a translator’s job easier while improving quality. Now widespread across the industry, these tools are not to be confused with machine translation (e.g. Google Translate). Just like any tool, CAT tools need to be handled correctly and used on high quality material. Broadly speaking, CAT tools are complex database programs which save translations and terminology for future use. And we all know that any database can only be as good as its contents. CAT tools can help to speed up the translation process, reduce companies’ translation costs and ensure consistent use of terminology. From reducing writing time and improving consistency to increasing reliability and integrating terminology, these tools have many benefit. Translation memory – a database of previously translated segments. Whenever the translator works on a new text, segments are analysed to see if they have been translated before. Even if there is only a certain degree of similarity to previous entries (normally between 75% and 100%), the archive will suggest possible solutions, which the translator can then accept, modify or discard. Terminology database – this functionality of the CAT tool suggests target-language terms for words or phrases in the source text. Just like translation memories, terminology databases must first be filled with source and target terms, as well as other information, such as the source, context, etc. Alignment tools – these allow existing translations (from two different files) to be imported into a translation memory system. What does a translator’s work look like when using a CAT tool? To start with, the documents to be translated are divided into individual segments (usually sentences), which – by most tools – are arranged into editing windows. The above screenshot shows the segments, which are numbered, the source text in the text column on the left, and the translation in the text column on the right. 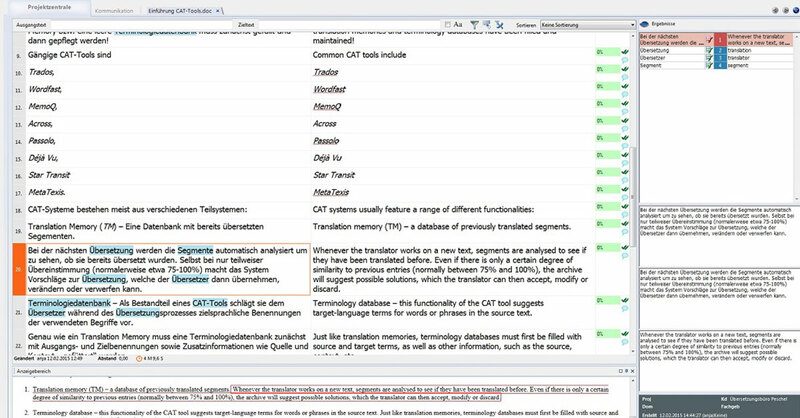 Further on the right, the results from the translation memory (marked in red) and from the terminology database (marked in blue) are shown. All translated segments are stored in a translation memory. Whenever a segment has been translated previously, the translation stored in the translation memory will be shown automatically. The same goes for entries in the terminology database. Server-based CAT tools even allow for several translators to work on the same project simultaneously, with all entries being available to all project participants. This ensures a high level of terminological consistency both within and between translations and projects. CAT tools also facilitate a proofreader’s role thanks to their in-built QA function, which checks that the translation contains customer-specific terminology, avoids “forbidden” terms and checks the spelling. CAT tools do not do the work for the translator, but their many benefits make them an indispensible tools.